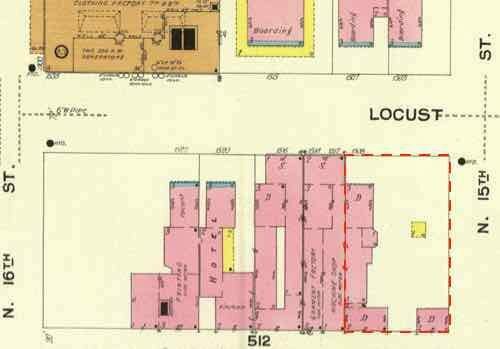 In the middle of the 19th century the mansions along Lucas Place, now Locust St, were considered way out on the edge of town. 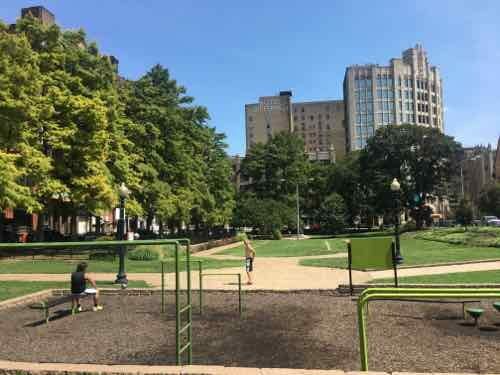 This 3-block oasis didn’t last long as St. Louis’ population exploded. The wealthy began to move Westward — this still happens in the region.One by one the grand old mansions became rooming houses and eventually razed for offices/warehouses. More about the museum in a bit. The Campbell House, lower right outlined in blue, was dramatically different by the time this Sanbon Map was made in February 1909. Click image to view source. At this scale you can’t read that the abutting 24 foot wide lot includes a machine shop and garment factory. The next house West is still a residence but then we have a hotel and finally a printer. 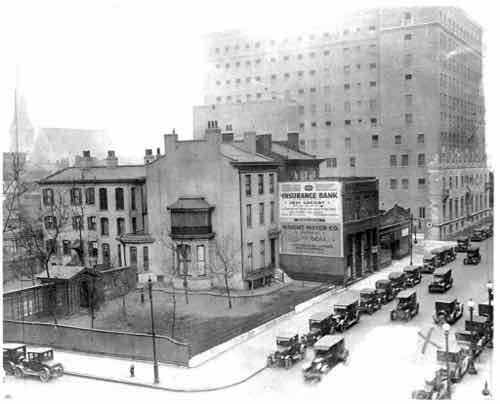 Across Locust St in the upper left is the Ely Walker Annex, and three old mansions turned into boarding houses. You’ll note the YMCA, closed in May 2017, hasn’t been built yet. 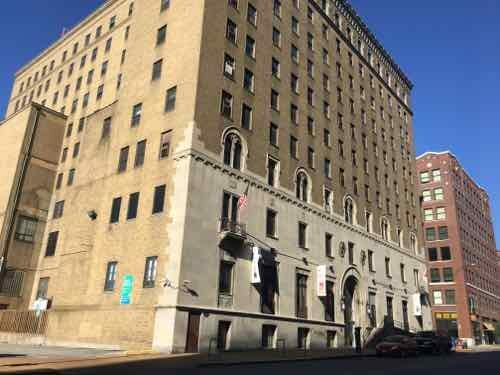 The YMCA is the last of the Campbell’s neighbors as Hugh and Hazlett Campbell were still alive for the first years of operation of the Downtown Y. 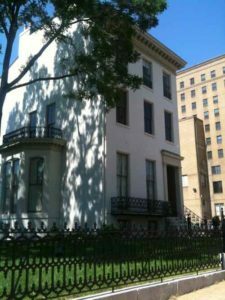 Yes, the Campbell House Museum is owned & operated by a private group — NOT the City of St. Louis. The museum opened on February 6, 1943 — 75 years ago tomorrow! 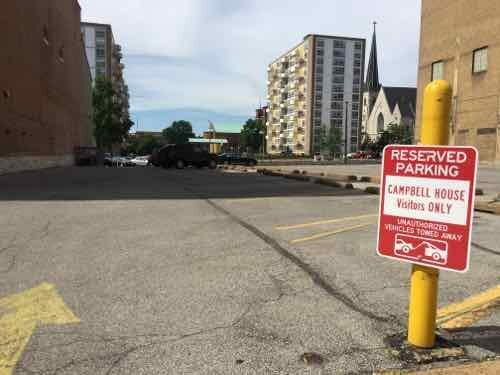 The space between the Campbell House Museum and the former YMCA has been surface parking since the 1940s. 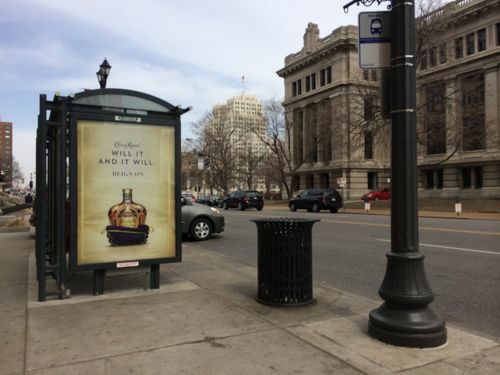 Despite what you might think, it isn’t one big lot for the Y. The 24′ wide lot next to the CHM is guest parking. 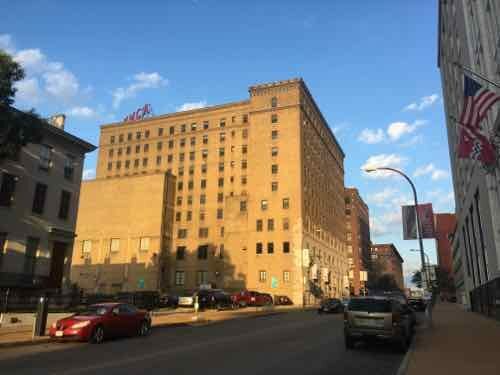 They didn’t raze the building that was there — American General Insurance, now Terra Cotta lofts, used it for surface parking. 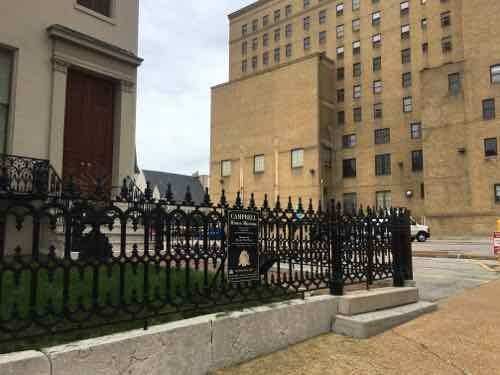 The Campbell House Museum is planning new construction on the back of their narrow lot to construct an accessible entrance. At the front I’d like to see a building come within 5-10 feet of the CHM — with the same setback. 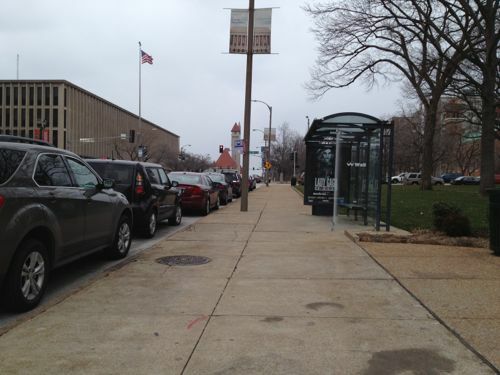 In the rest of the gap I’d like to see infill step toward Locust — eventually meeting the sidewalk like the TMCA does. This building could be shallow to conceal a new parking garage at the rear of the lot. I’d like all 3 automobile driveways in the gap area closed. A new garage can be accessed via the alley. Of course I want to see the former YMCA building renovated and occupied. It may take years, but it’ll happen. When it does I’m not so concerned about it as I am about the gap. 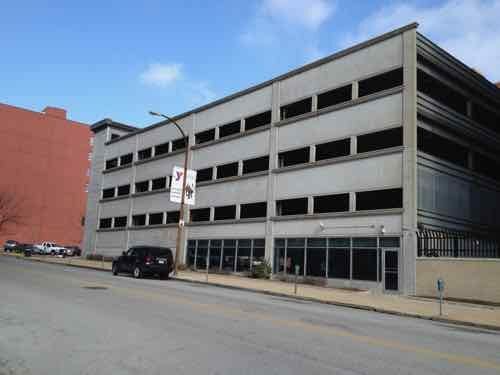 It shouldn’t stay as surface parking, nor should it be another bland garage facing Locust. I would like to see the infill represent the best of 21st century design — in between 19th & 20th century buildings. Again, tomorrow is the 75th anniversary of the opening of the Campbell House Museum. If you haven’t seen it I suggest you make an appointment or visit in March when regular hours resume. Before the automobile public right-of-ways (PROW), public-owned land that connects private property, was shared by pedestrians, people on horseback, horse-drawn carriages, trollies pulled by horses, etc. PROW in cities were becoming increasingly crowded. Many roads were unpaved, those that were in cobblestones. Waste from horses & mules made the PROW filthy. The new automobile made the PROW even more crowded. More than a century ago, a civil engineer in his late 20s arrived in St. Louis. Bartholomew, like his better-known contemporary, NYC’s Robert Moses, believed it was necessary to destroy the city to save it from itself. Everything prior to the 20th century was wrong for the modern world of the automobile. 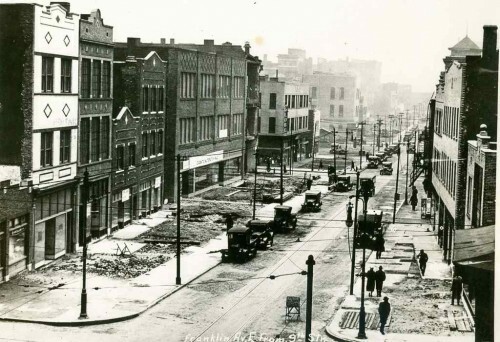 Most St. Louis streets were laid out with a width of 60 feet. A considerable volume of traffic can be accommodated in a 60-foot street with a 40-foot roadway, especially if curb parking is restricted at times of heavy traffic flow. Such streets as Nebraska, Compton, and Goodfellow can pr6bably continue for many years to accommodate a considerable volume of traffic flow without widening. All local residential areas require access and must be served either by wide major streets or by these secondary streets which thereby become important integral parts of the major street plan. 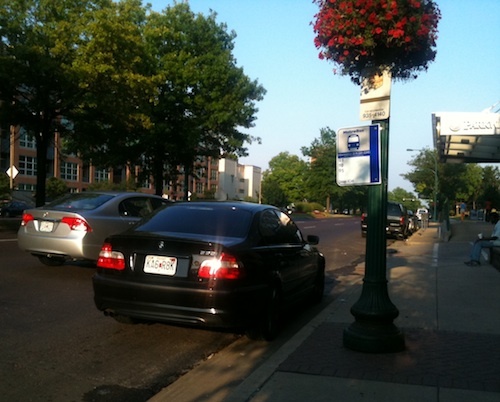 Grand Avenue, Chippewa Street, and Easton Avenue are examples of important cross-town routes which accommo date a considerable volume of traffic including mass trans portation facilities (i.e., streetcars or buses). Their general width of 80 feet permits a 54 or 56 foot roadway to accom modate six lanes of traffic. There is need for quite a number of such routes where traffic volume is insufficient to warrantgreater width of the street except by expensive widening of the street. These are the main traffic ways, as for example Gravois Avenue, Market Street, Natural Bridge Road, Lindell Boulevard and Kingshighway. They are the dominant structural elements of the street plan. Their traffic capacity is unusually high since they permit three or four lanes of moving traffic in each direction. It is impractical to provide for streets with wider roadways because of weaving and complications encountered in traffic control. When traffic volume becomes so great that it cannot be accommodated even on eight lane surface highways it becomes necessary to provide for uninterrupted traffic flows through grade separations in the form of depressed roadways in wide right-of-ways or by roadway elevation. An overall right-of-way width of 200 feet is generally considered a minimum standard. This is far more costly than street widening but a limited mileage can be justified where there is sufficient traffic volume. In today’s money that’s nearby a billion dollars! I’m uncertain if any city carried out the costly widening of the PROW the way St. Louis did. Based solely on my personal observations in other cities, I’d say St. Louis was the most aggressive. It’s no wonder that more than a quarter of those of voted in the recent non-scientific Sunday Poll have a problem with road diets. Q: Agree or disagree: ‘Road Diet’ projects slow traffic too much, cause congestion; should be reversed. Sadly, our road diets have been designed to appease critics, so sidewalks new still too narrow — barely wide enough for existing for traffic. Motorists usually drive on typically wide Set. Louis area streets then encounter the “Great Streets” section for a brief period before returning to the more common Awful Streets of our region. We’re too timid to do more, so it can have a ater impact on population density, pedestrian/transit rates, etc. Bartholomew also thought St. Louis’ population in 1970 would increase to 900,000 — it had dropped to 622k. Fingers are crossed we don’t drop below 300k in 2020. If St. Louis wants to grow again the entire region needs to reject the many ways Bartholomew screwed up our region. Recent work downtown has been mostly good for pedestrians, but Saturday night my husband and I found an awful corner: the NE corner of Market & Broadway. This is the SW corner of the Old Courthouse. 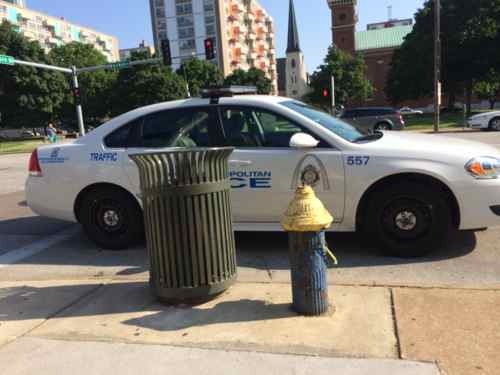 I;m not sure who gets the blame, the possible culprits are city streets dept, city board of public service (BPS), MoDOT, National Park Service, or Gateway Arch Park Foundation. Most new work has gotten away from placing one curb ramp at the apex at the corner, instead doing a ramp/crosswalk to cross each street. This improves ADA-compliance and reduces inconveniences for all pedestrians. We had to cross the ramp on the NE corner of Market & Broadway as we crossed Broadway. Both times the ramp was full of pedestrians waiting to cross Market. Both times I had to ask others to move. 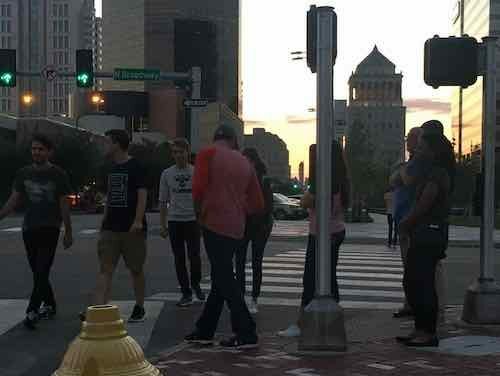 Heading back to Kiener Plaza I snapped this photo of the crowd at the corner, two guys on the left are avoiding the crowd at the corner by walking in the street — not an option for those of us who use mobility devices. 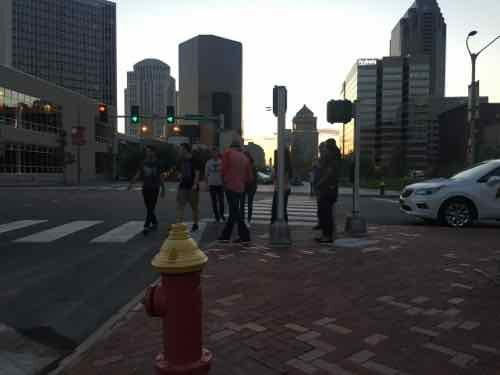 In this crowed view you can see hoe the one crosswalk is angled to meet the sole curb ramp. 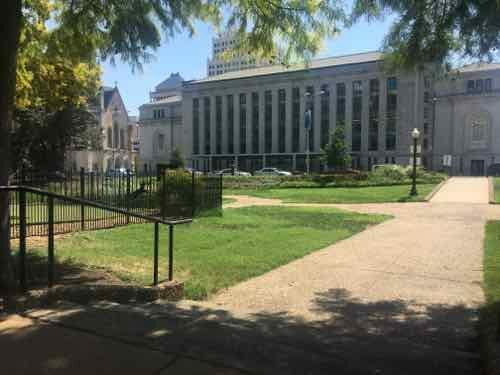 The idea is to get Arch visitors to start in Kiener Plaza, so this corner should see many pedestrians. It amazes me each crosswalk doesn’t lead to its own curb ramp. No, I’m not amazed. I’ve experienced first hand how even brand new work ism’t designed by people who think like pedestrians. 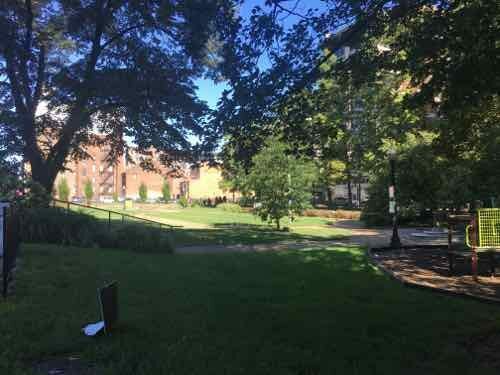 Since moving downtown nearly a decade ago I’ve spent a lot of time in Lucas Park, just two blocks to the East. 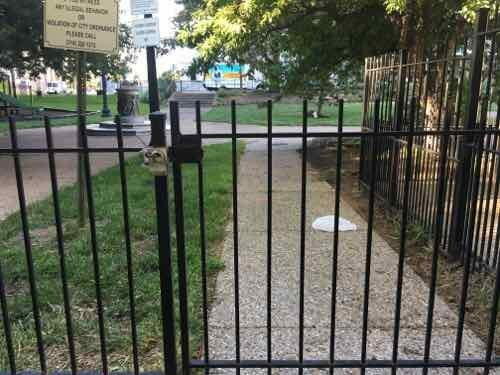 Unfortunately, the city has me locked out of the park. 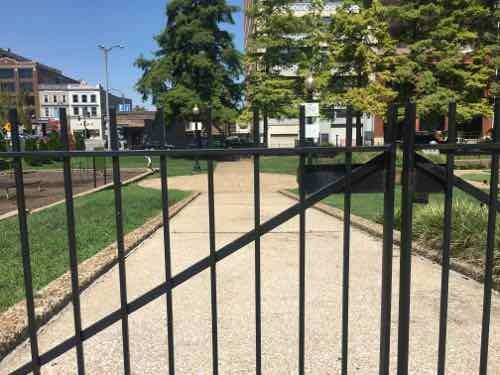 Lucas Park has four entrances — two along the South edge off Locust St, and two along the North edge off St. Charles Sr. 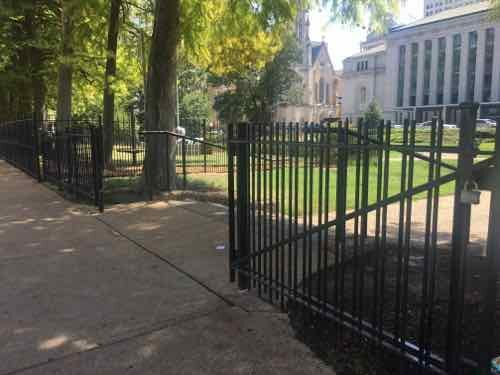 The city’s parks department keeps the two South gates locked and opens the North gates during the day. The problem is the two North gates both have steps. 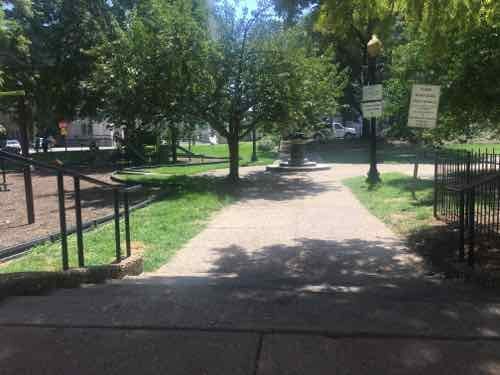 When I first began visiting Lucas Park only one ramp existed — the South entrance nearest to 14th. 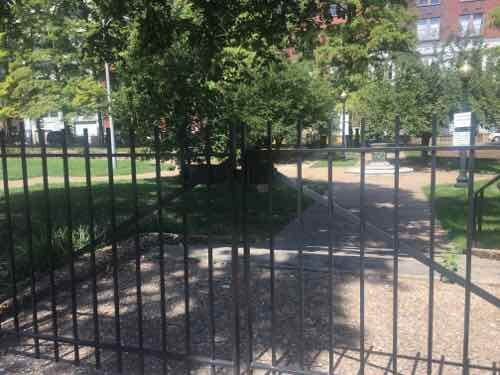 When the dog park was added a 2nd ramp was installed near the North entrance nearest to 13th. That pedestrian gate gas unlocked by the nearby gate at the ramp does not. It’s impossible for me, while using my power wheelchair, to use Lucas Park. 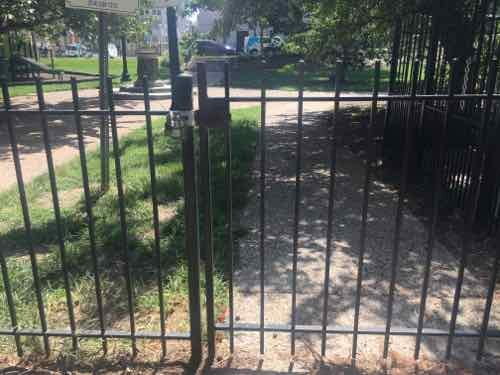 The SW gate is locked on Wednesday August 23rd @ 8:32am. An hour later, on the way home from the grocery store, the park still looks inviting. Wednesday I emailed the first two photos to a couple of city officials and posted them to social media. Yesterday was also a very nice day, I tried to visit the park again on my way to the grocery store. 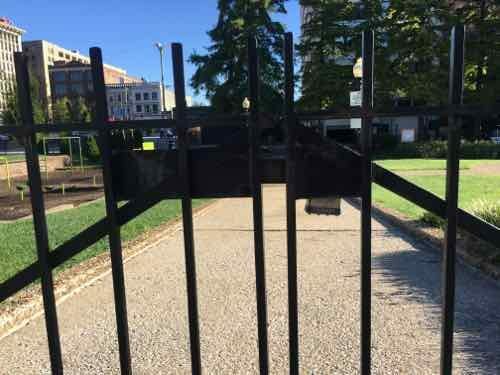 The SE gate was locked. 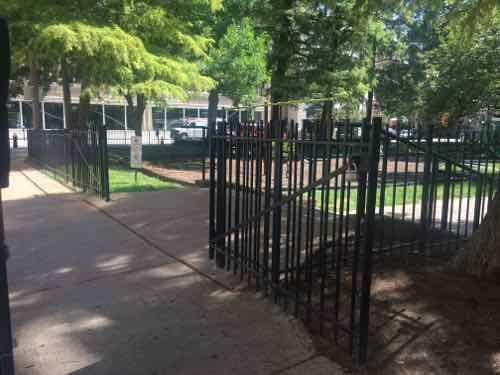 As I understand it, city parks dept employees come out to unlock the NE & NW gates, but don’t unlock the NE gate for the ramp. I don’t think this is deliberate, just another example of people not thinking.